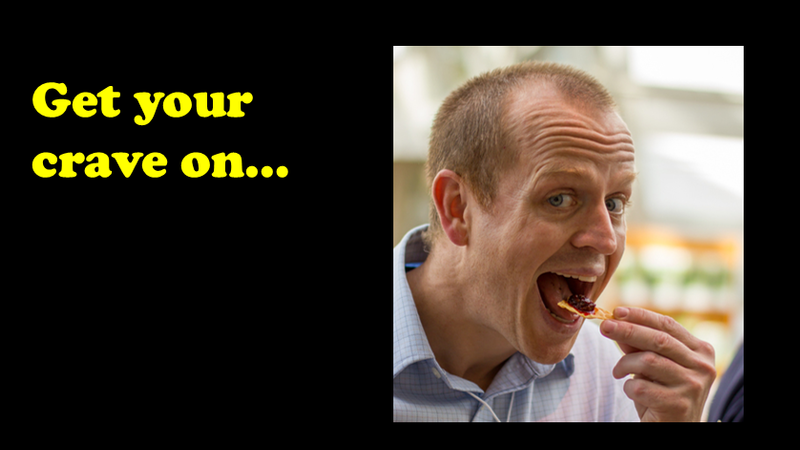 My talk—“From Cringe to Crave: How I Got Over My Disgust for Eating Insects”—came out of a group project for my Evening MBA marketing class. Edible insects are a highly sustainable, nutritious and easily-produced food source that could become increasingly relied upon as the global population grows. Even though most of the world incorporates bugs in its diet, this does not happen in United States. But taste is a culture construct and a construct can change. (See the history of lobster.) Our MBA project showed how changing this construct is a marketing problem and a compelling business opportunity. I was encouraged by this class project and am now developing a business plan around edible insects. 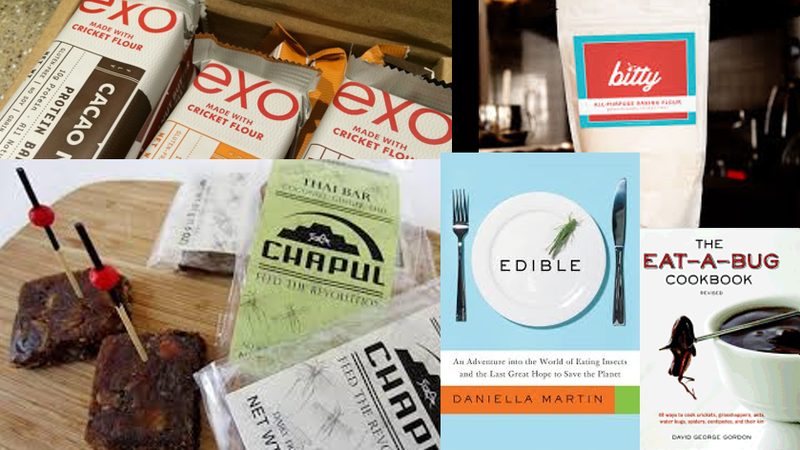 But in order to create a business around convincing others to eat insects, I first needed to overcome my own aversion to bug-eating (i.e., entomophagy). I am going to use my Ignite presentation to talk through how I went from instinctually cringing at the prospect of eating a cricket, to craving its nutty crunch. The presentation will feature images of the bug foods I’ve eaten, the bug-cooking I’ve attempted, and the bug-food events I’ve hosted. This is a philanthropic event. Tickets are $9 in advance and $14 at the door with all proceeds going to Sustain Dane. Sustain Dane is a 501(c)3 non-profit that connects world trends to local needs and interests to create innovative new projects. Come on out, support a cool event, learn some new things, and connect with a diverse community of sustainability champions. For the limited amount of land that can support agriculture, 70% is taken up with livestock production. 80% of water goes to agriculture for plants and livestock, and half of that goes to feed for livestock–because the animals we eat eat a lot of feed. With a population set to grow almost 30% in the next 35 years, we’re going to need to double current food production (according to UN estimates). Not only is there not enough land to support this increase, the ecological impact to already-limited water resources would be devastating. 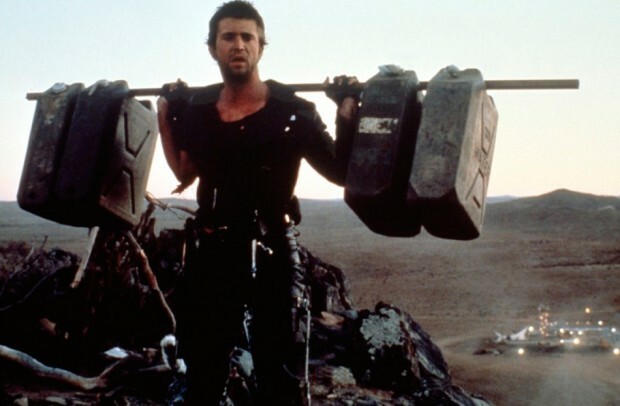 Like Mad-Max-post-apocalyptic-water-wars-type devastating. What if we could increase food production while decreasing the environmental impact to land and water? Large-scale insect farming could be that solution. Although the exact numbers on the water to raise insects in a farm setting are unavailable (but Youngstown’s Big Cricket Farms may soon have answers…), it can be assumed they would be significantly lower. 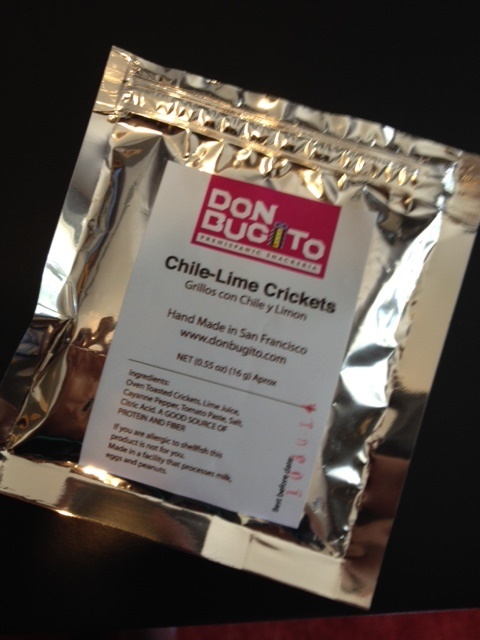 Consider the drought-resistance of mealworms and crickets. 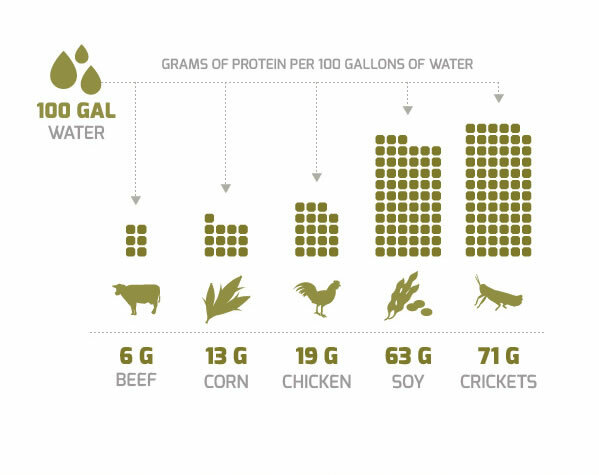 And consider Pat Crowley, a water conservationist who came up with his cricket energy bars—Chapul—to show how a protein source could be produced using minimal water resources. See their neat chart (and order some bars…Mark Cuban has…). And then consider land use. Crickets don’t need to be grown on the prairie, and perhaps it may be more risky to due to pesticide exposure. It’s already been shown the advantages of urban honey production. Insect husbandry may be a way to reclaim abandoned industrial and urban spaces. Tiny Farms has already designed and offers cricket farming structures you can setup in your own garage–and who knows, eventually in multi-story cricket protein production facilities. BONUS: Instead taking all the corn we’re so great at overproducing and putting it into obesity- and diabetes-inducing high fructose corn syrup, it can be fed to protein-enriching crickets who are efficient corn-processing machines. So perhaps when you order your McCricket of the future (or of the now if you’re in NYC), you can avoid the methane plume, walk off with a fraction of the water. Don’t know about the cricket poop. Yet.